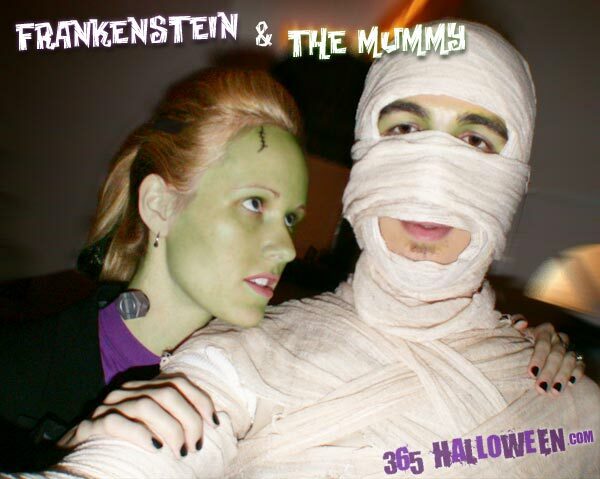 2004 was the year of the classic monsters for us and I really wanted to be Frankenstein to Sean’s Mummy. After doing some Googling I found that there are really a lot of variations on the Frankenstein costume and that I would start with the basics and get creative from there. Materials: Black thrift store blazer-type jacket, purple t-shirt, black pants, black platform shoes, neck bolts, "fishing wire", black clip-in hair strips, Halloween makeup kit, black nail polish. I began with a black blazer (with slightly short sleeves, just like Frankie) from the thrift store and dug out a pair of tightish stretch cotton black pants and black platform loafers from my archive of office clothes. I also had a small purple t-shirt laying around that I had been meaning to reconstruct and wore that underneath the jacket. For makeup I put on a layer of foundation followed by a layer of green Halloween makeup. Brown eye shadow went onto my lids and under eye area, along with a little smudgy charcoal eyeliner. Using the same eyeliner I drew 2 little stitched wounds on my forehead. Since this is a decidedly girly version of Frankenstein I went ahead and added a little pinkish lipstick, too. Neck bolts I had a little problem with. I visited several Halloween stores to see what the options were, and settled on the least lame looking pair. They were supposed to attach via suction cups but that didn’t work at all. Would a little product testing have hurt the manufacturers? Sheesh. So I tried using spirit gum to attach the suction cups and that didn’t work either. I settled for wrapping some clear “fishing” wire around the suction cups and tying the whole thing around my neck, which was pretty annoying and increasingly painful as the night wore on. The pairs of Frankenstein bolts that are supposed to attach via spirit gum were not stocked in any stores in my area, and in hindsight I would have just ordered the damn things from the Internet. For my hair I went totally unconventional with just a nod to the original mound of black hair that Frankenstein had. I put the front section up in a barrette, creating a small faux pompadour. I then clipped in 3 strips of black hair (from the Halloween store, attached via cheap clips) and pulled everything into a ponytail. The black streaks made a striking contrast on my blonde hair. And of course I painted my nails black, or rather I touched them up because I have them black for a good 2 months around Halloween. Ta da, Female Frankenstein. Obviously I neglected to take good pictures because I wasn’t that proud of this costume and the lighting at the Halloween party sucked. So, sorry about that. I had to really touch these up in Photoshop so you could see everything. 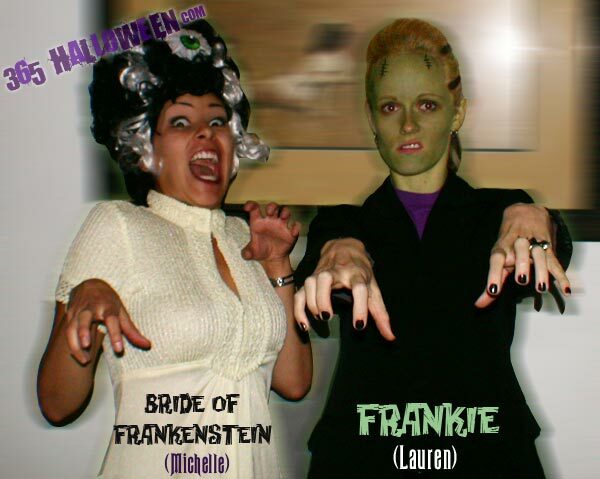 And dig the hostess Michelle as Bride of Frankenstein! We didn’t even coordinate that shiz on purpose. Hah, anyway, enjoy. create your own Frankenstein Costume. Subscribe to comments with RSS or TrackBack to 'Frankenstein Costume'. I used small wedding bells from Dollar Tree as the bolts. I glued them to a green dog collar. It worked out nicely! bolts? easy. Take any styrofoam you can find from around your house. Packing for computers, the green stuff you find in craft stores, anything. Use a exacto knife to cut the six sided shape out and make it about 3/4 of an inch thick. Cut Duck tape into 3/4 strips and wrap a piece around the outside(around the six sides)of the “bolt”. now cut out the shape of the bolt(by tracing the shape of your bolt onto the tape) and stick it on the face. Spirit gum will hold these light weight bolts onto your skin all night long. For the neck or temple bolts, I used wooden thread spools I bought at a craft store. I spray painted them silver and used the spirit blue which worked fine since they were so light weight. Why is it sooo hard to find the bolts!? This is ridiculous, Frankenstein is a popular halloween costume and bolts should be sold almost anywhere! I made them out of paper and tape coloring the tape gray and i am having trouble thinking on how am i going to stick them on. i dont wanna use the fishing wire since my son will be the Frankenstein. Help!!!! 365 Halloween Response: F’reals. Get with it costume manufacturers! Since the costume is for a child, your best bet is probably to attach those homemade bolts to a plain kid’s headband and have him wear it around the back of his neck. A more constrictive, yet more invisible, option would be to attach them to clear elastic that goes all the way around the neck. Think of those “clear strap bras”. You can get that elastic online in varying thicknesses. Another option might be to attach the bolts to some thick (1″ or more) flesh colored ribbon to and then decorate the ribbon with black “stitches” so it looks like his whole head was sewn on. Good luck and let us know how it turns out! I’m trying to find those neck bolts on the bottom of the picture. The ones you use spirit gum for. Are they online somewhere? Thanks! 365 Halloween Response: Several years ago when I made this costume, I could only find UK retailers online that sold them. Is Frankenstein more popular there? Readers, if you know of a place to buy these bolts, please let us know.